PLEASE NOTE THIS DOES NOT FIT "M" MODELS. Solo Werks provides "real coilovers for real people". 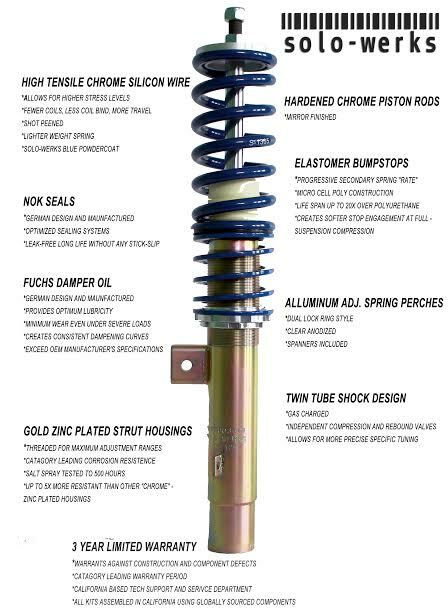 With a heavy gold zinc plated housing and silver spring perches, the Solo Werks S1 Coilover System will provide you with a long lasting, quality ride with style. The system includes platform specific spring rates and matched valving, giving your BMW E39 specific ride heights and settings made for your model. The front lowering ranges are 40mm-80mm (1.6"-3.1") while the rear lowering ranges are 20-50mm (0.8"-2.0"). If you're looking for a way to lower your ride and maintain your ride quality, these S1 Coilovers by Solo-Werks are for you! THIS DOES NOT FIT M MODELS, M APPLICATION COMING SOON!